Hi everyone! 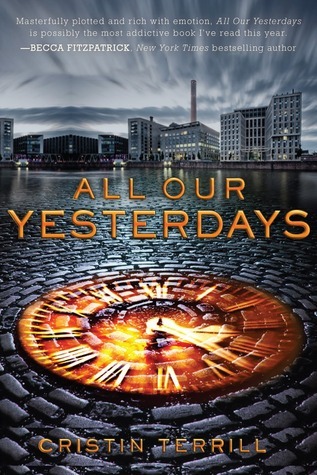 This is Elicia here and I'm happy to say that I had a chance to interview Cristin Terrill, author of All Our Yesterdays! Everyone welcome her with open and loving arms! Elicia: Why did you choose time travel as a focus for All Our Yesterdays? Cristin: I'd say I didn't really choose time travel, it chose me. I've always loved time travel stories but had never really thought of one until the idea for ALL OUR YESTERDAYS hit me, and then it just wouldn't let go. Elicia: What do you think of the hype the book got? Cristin: It's hard to really judge how much hype there is or isn't from the inside because my entire day is ALL OUR YESTERDAYS all the time anyway, but anyone talking about my book at ALL is pretty surreal. I never really, truly grasped the reality that getting a book published meant people would actually READ it until a few months ago, as silly as that sounds. It all feels very much like it's happening to someone else. Elicia: If you could be a character in All Our Yesterdays, who would it be? Why? Elicia: How would you feel if your book won a literary award or was promoted to become a movie? Cristin: Stunned I'm sure. The book was optioned for film and there's a screenwriter working on it right now, and that doesn't feel real to me at all! It would be incredibly strange and also so, so fun to see a movie that started as some wild idea I got years ago when I couldn't sleep! Elicia: Have you ever thought of co-writing a book with another author? If yes, with who? Cristin: I think it would be really fun and interesting to co-write a book if the opportunity ever came up. I have no idea with whom, though, because although there are tons of writers I admire and would like to work with, our writing styles and ways of working would have to mesh together really well for it to be successful, and there's no way to know who I might be compatible with in that way! ABOUT THE AUTHOR: Cristin Terrill has a bachelor of the arts degree from Vassar College and a master of the arts degree in Shakespeare Studies from the Shakespeare Institute in Stratford-upon-Avon, UK. She currently lives outside Washington, D.C., where she teaches creative writing workshop for kids and teens. ALL OUR YESTERDAYS is her first novel. Fabulous interview. I love the book. I just picked it up this weekend so I was thrilled to see you had a chat with the author. This is a great interview, I'm so excited that the book is becoming a movie! That is the best news ever. I really enjoyed the book too, here's my review.